There are several things I like about the Anchor Standards for Reading. I like three of the four sections: key ideas and details; craft and structure; and integration of knowledge and ideas. I like the last of the standards; in fact, I think it is a well-stated goal for readers but I think the title for that section is dumb. I like the connections between the sections and the organizational flow of the sections which, in some ways, mimic not only the way we might think about the constructing of texts as we deconstruct them as readers, but the way writers think about readers. When I talk to educators about the Anchor Standards for Reading, I speak to them from the perspective of a writing teacher. Time and time again I would remind my students to think about the audience--how they wanted their readers to engage with their texts; what they wanted their readers to think or feel or know or do and how they would convey that to their readers. It's probably why Craft and Structure is my favorite section. Oh sure, Key Ideas and Details are important. Of those three standards, I think the most significant is the first. The second standard is an outcome of the first because those who can determine the central idea of text and who can summarize the key supporting details and ideas have read closely, made inferences, and are able to cite textual evidence to support their thinking. The third standard is, in my opinion, an extension of part of the second standard in that those who are capable of analyzing the development of a theme have had to identify who or what has developed throughout the text, and how and why that has happened. Again an extension of reading closely, making inferences, and citing textual evidence. Craft and Structure means the reader has paid attention to words, sentences, and paragraphs. I recently read a delightful blog post, Baffling Dictums: On the Rules of Writing. I was one of those writing teachers who could be really strict about particular rules, but generally pushed my students to break the rules if the rules didn't fit what they were trying to accomplish. HOWEVER, I told them they needed to know why they were breaking the rules and why breaking the rules improved their writing. I remember in both writing and literature classes getting excited about the structure of a sentence and no doubt annoying my students talking about word choice or punctuation choices. I distinctly remember reading a passage of Milton's Paradise Lost to my students and seeing the glaze clear from their eyes and one student saying, out loud, "Oh! That's what that means." The craft of the writing and the structure of the work are what makes a text come alive for a reader. The craft and the structure are the tools writers use to ensure that readers experience what the writers want or hope they will experience. Integration of Knowledge and Ideas is a gift. When any reader can make connections between other texts, it is a gift to that reader because that reader has discovered one of the many silken threads that connect ideas--between content areas; between writers of different times, ages, demographics; between cultures and schools of thought. What I don't like about the wording of the standards in this section is that they sound so pedantic and uninteresting. They make the process of integrating and knowledge sound sterile rather than one of discovery and exploration. The intent of the Anchor Standards for Reading is honorable. We want students who can and will learn to read between the lines of a text and make sound inferences based on not only the words, but the craft and structure of the text (yes, punctuation matters!!). 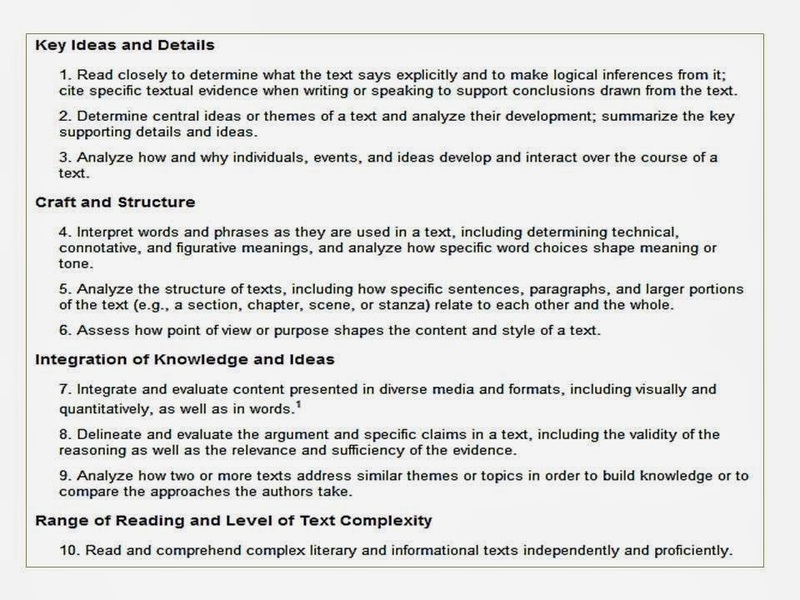 We want students to be able to make connections between texts they read because they have learned how to analyze a text deftly, but they have also learned how to cite textual evidence (including craft and structure as well as that integrated knowledge and ideas) to support a position, or maybe to answer a text-dependent question. We want students to become independent and proficient readers of any text. I think the subtext of the Anchor Standards for Reading could be that we want students to become readers who can delight in connections and discoveries; who can become good judges of quality writing and know why that writing is good; who know how to analyze and summarize a text with competence and confidence; and who become better writers, thinkers, and speakers because of their reading skills. I'm not sure I can take another "trend"